If you bought cards for all of your friends and family for every birthday, anniversary, new job and house move, things could soon get very expensive – but there is an alternative. Rather than head to the shops to select a card that you need to pay you, why not send an electronic card online free of charge? As well as saving money, you can do your bit for the environment by avoiding traditional paper-based cards. But where to start? As with so many services, there are countless ecard options to choose from. To save you hunting for the perfect card, we've gathered together the five best free ecards sites out there. Whatever the occasion, you're sure to be able to find a customizable card to send. Just Wink has a wide range of free ecards to choose from, and there's something for every occasion. There are static and animated cards across a huge number of categories, and several different ways to send them. You can send digital versions of cards via email or Facebook free of charge, or have a physical card printed and mailed for a fee if you live in the US. There is a decent selection of traditional card designs, but there are plenty of quirky and cheeky designs to choose from as well. If you're forgetful, you have the option of scheduling cards to be sent months in advance, and there are mobile apps so you can create and send cards from the comfort of your phone. Try to turn a blind eye to the look of 123Greetings – the site as though it's slipped from a mid-90s CRT screen. Despite that, it has a lot to offer. There are cards for every occasion, ranging from very simple static designs to lengthy animations. There are a couple of extras to look out for as well, including a mobile app and a Photocard option, which can be used to quickly turn any photo into a card. It's possible to schedule cards to be sent a couple of months in advance, but you can also set up reminders online to make sure you sort out something in time. If you like the idea of ecards but you're still attached to the look of traditional folded paper designs, Punchbowl could be just what you've been looking for. There aren't as many options as you'll find on some other sites, but the quality is very high and there's something to suit all tastes. The only drawback is the number of ads on each page. Customization options are kept to a minimum, but that's perfect if you want to send a well-designed, no-fuss card as quickly as possible. 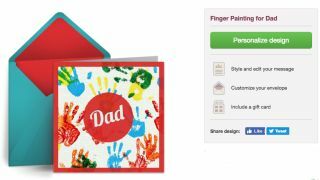 You can send cards to several people at once – perfect if you're sending out invites – and the virtual envelope and card open with fun animations. If you feel a little cheap sending a free ecard to someone important in your life, Punchbowl gives you the option of buying a gift card to include as well. CrossCards is home to not just fairly standard free ecards, but also designs with a religious theme. This won't be to everyone's taste, but if you're looking for wholesome cards, many of which have faith messages, this is a great place to find them. There are fewer designs and categories to browse through than you'll find on some sites, but things like birthdays, anniversaries and holidays are all present and correct. CrossCards' cards are all static images, relying solely on text and imagery to get their sentiment across – no flashy animations. There’s no scope for personalization beyond attaching a message to a card, but you can choose to schedule delivery for a date in the future if you want to sort out all of your cards at once. When you send a free ecard, take care not to inadvertently sign up for special offer emails unless you specifically want to receive them. Like Punchbowl, Open Me leans towards more traditional card designs rather than bold, animated creations. There's a decent selection of ready made ecards to choose from, which you can customize with your own message. You can also personalize a blank card with your own photo, and there's range of templates designed to show off an image or two on the inside and rear. You can send cards via email, or post them to Facebook if you would like to share them more publicly. Delivery can be scheduled several months in advance, so you can spend a little while sorting out all of your cards for the year and not have to think about them again. Group Cards is a particularly nice feature, which make it possible for several people to collaborate on a card – great for celebrating birthdays in the office.